The Market Street Report: Who’s Voting? The 2016 election has certainly been one for the books. This week marked the last presidential debate in what has been considered one of the most divisive elections thus far. Given some of the topics and polarized views, and being the data nerd that I am, I thought it would be interesting to take a quick look at who will likely be voting in this year’s election and ultimately deciding who our next president will be. Turns out, this year’s electorate will be the most diverse one yet in terms of age, race, and ethnicity. 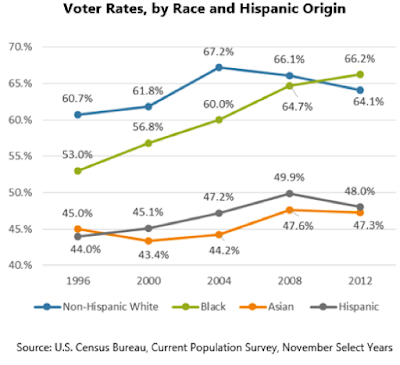 According to the Pew Research Center, roughly one-third of eligible voters this year will be Hispanic, African American, Asian, or another racial or ethnic minority. 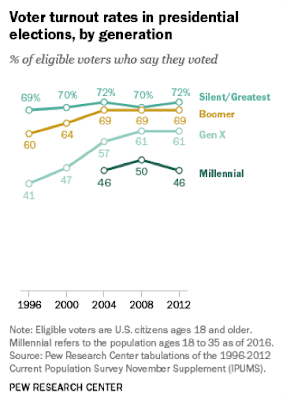 Additionally, as of April of this year, the number of millennials that are of voting age is nearly equal to that of the Baby Boomer generation (69.2 million compared to 69.7 million). Yet, despite population dynamics and the electorate becoming more diverse, the percentage of eligible voters that are actually voting is another story, and parties on both side of the aisle are concerned about voter turnout. The following headlines from various news sources reflect the uncertainty surrounding this year’s election. Historically, voter turnout has varied significantly among the different age groups, races, and ethnicities. Although millennials will soon account for the largest share of the eligible voters, they trail every other generation when it comes to voter turnout rates. 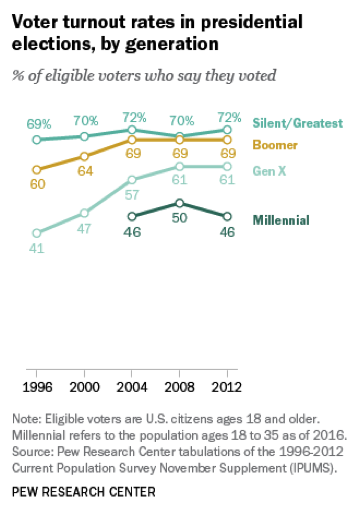 Less than half of millennials eligible to vote in 2012 reported voting, while nearly 70 percent of Boomers voters turned up. Likewise, according to U.S. Census Bureau, 66.2 percent of black eligible voters and 64.1 percent of white, non-Hispanic eligible voters cast voters. 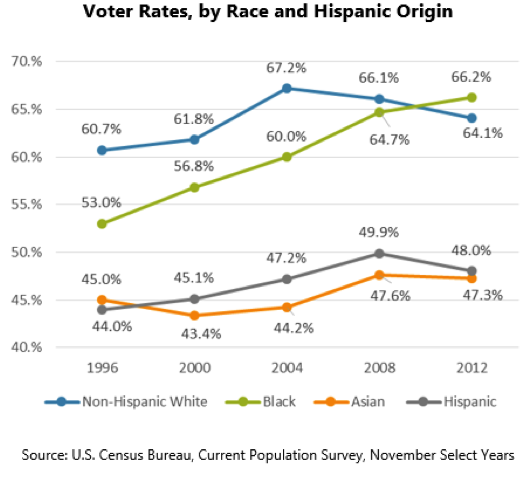 However, voter turnout rates were lower among Asians and Hispanics; only 48 percent of Hispanics and 47.3 percent of Asian eligible voters reported voting in 2012. Across the U.S., the District of Columbia, Mississippi, Wisconsin, Minnesota, and Massachusetts had the highest turnout rates in 2012 according to the Census Bureau. Voter turnout among the five ranged from 75.9 percent to 70.8 percent. Meanwhile, West Virginia, Hawaii, Oklahoma, Arkansas, and Texas had the lowest, with roughly half of the total voting-age population having reported voting in 2012 in each state. Such a wide range of turnout rates among the states raises even more uncertainly about the electoral votes, certain battleground states, and what to expect November 8th. Beyond differences in opinions on topics and stances on issues, the ultimate outcome of the election will come down to who shows up at the polls to cast their vote. Obviously, the goal is for all voters to cast their vote in every election, but historically, this has yet to happen. Hopefully, turnout rates continue on their upward trend for this year’s election. Either way, for better or worse, this election will be over in a few weeks and we can hopefully all more forward as one.